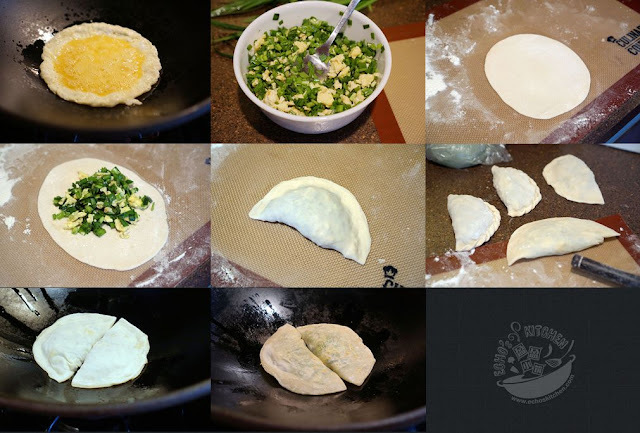 Chinese chive pocket is one Chinese dish that loved by all three of us in the house, even my 5 year old is able to finish two pockets at a time, which is pretty rare. 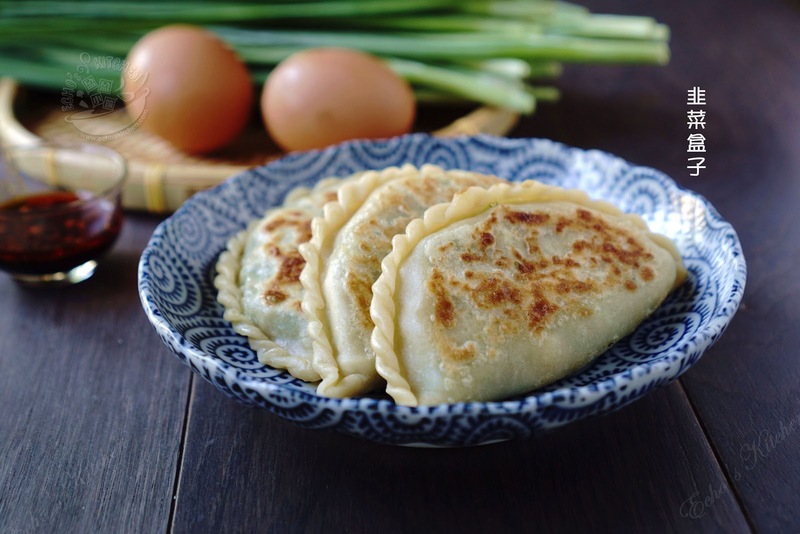 This Northern Chinese delight is a type of pan fried flat dumplings filled with chopped Chinese chive, scrambled eggs and some people likes to add mung bean noodles or Shrimps. 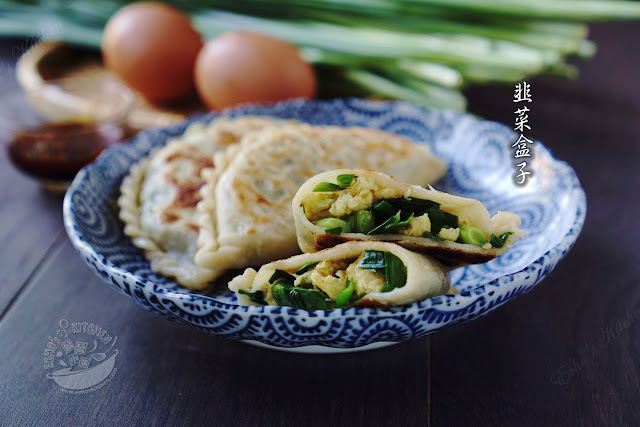 We liked ours to be just simple Chinese chive and eggs. 1. Place flour into a heat proof mixing bowl, add a pinch of salt and mix well. boil some water on the stove, as soon as the water starts to boil, turn it off, measure 1/2 cup and slowly pour the hot water into mixing bowl. 2. Quickly stir the flour with a pair of chopsticks or a silicone spatula until the flour turns into small lumps. Now add the room temperature water and knead the flour to form a soft, smooth dough, cover the dough and leave to rest for 20 mins. Note: Some people like to make their dough with only hot water, which also called "hot water dough", which gives soft texture to the wrappers. I like mine a little chewy and less sticky to handle, thus I opted for the "semi hot water dough" method, which called for both hot and room temperature water. 3. Meanwhile, work on the fillings, heat up about 2 tbsp of oil in a wok and fry the eggs, coarsely chop the scrambled egg either with the help of a metal spatula in the wok or on chopping board, finely chop Chinese chives. 4. Place the scrambled egg in a large mixing bowl, season with some black pepper powder，salt and Chicken bouillon powder. 5. Place chopped Chinese chive in a separate bowl, add sesame oil and mix well to coat oil over chopped chive, this step is to prevent chives from releasing water during the wrapping steps, it also retains crunchiness of the vegetable after frying. 6. 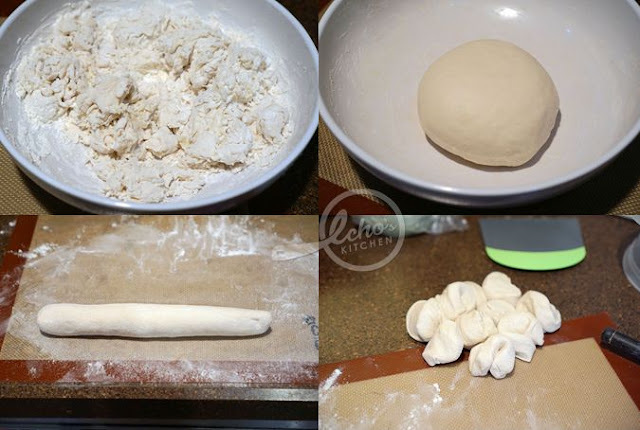 Divide the dough into 16 equal portions. Roll each portion into a thin disk about 15cm / 6inch in diameter, I like mind a little oblong in shape, which allows more fillings to be stuffed. 7. Place filling in the middle of the dough, bring the top half of the circle down and fold to make a semi-circle pocket, pinch or pleat the edges to seal. 8. Heat a frying pan or wok over medium heat, add a little oil to it. Place few pockets at a time in then cover with a lid. Flip over when the first side becomes golden brown. Cook until both sides turns golden brown. Serve hot with some soup or Chili sauce.